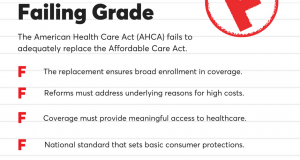 Letter from Consumers Union, the policy and mobilization arm of Consumer Reports, to the U.S. House of Representatives expressing our strong opposition to the American Health Care Act (AHCA) and the newly added amendment to eliminate Essential Health Benefits (EHB). The amendment introduced last night to eliminate EHBs effectively removes protections against discrimination for pre-existing conditions and would leave consumers at the mercy of insurance companies. Without EHBs insurers will begin a “race to the bottom” and drop coverage for expensive conditions, maternity care, mental health and substance abuse issues, among other areas. The elimination of EHBs would also return us to a time in which insurance companies placed annual and lifetime limits on plans. Currently, plans cannot limit care on an annual or lifetime basis that is part of the EHBs, which designates only the most essential categories of care for consumers. By eliminating EHBs, this legislation would effectively delete the ban on annual and lifetime limits for the very categories of care that people need most. This would be devastating for consumers with serious illnesses, like cancer.